We just got showered by customer love as we once again released another set of features that we heard from our customers — “Love your product”, “Traffic is such a great feature!”. We love to hear from our customers and appreciate all the great feedback we get to improve Automile. Just last week, we announced some great productivity enhancements to the product and you can read it here. Of course, anyone can see what traffic looks using tools like Apple or Google maps. But our customers in the field service industry, they want the ability to know this information layered on top of where exactly all their vehicles are on a map. That’s what we have developed as that is what is useful to them when managing their fleet of vehicles. Now if a business is wondering what the traffic looks like for a specific location or surrounding a specific route for any of their vehicles on the road, they can easily see that on the Live Map feature. With this information, they can quickly message the driver within the app and route the driver accordingly. They can plan and schedule their work and set the right expectations with the customers. By key locations we mean – it can be a job site or a business headquarter. It can also be an unauthorized zone which has a virtual fence and drivers shouldn’t go there during work hours. It has always been very easy with Automile to create Places (Naming a specific address that is frequently visited) or Geofences (creating a virtual fence to get alerted when a vehicle goes outside a predetermined area). 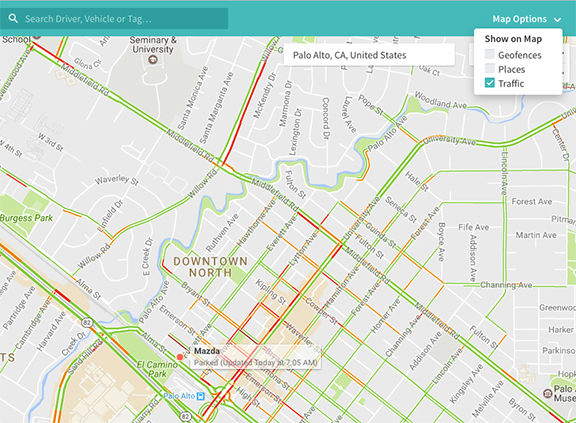 With the new feature, businesses can now see where their vehicles are in comparison to these marked locations. Worried that employees might be driving outside a designated area during the hours that they are not supposed to? or wish you could easily get notified only during specific days and time when the vehicle is driven in and out of a specific zone? 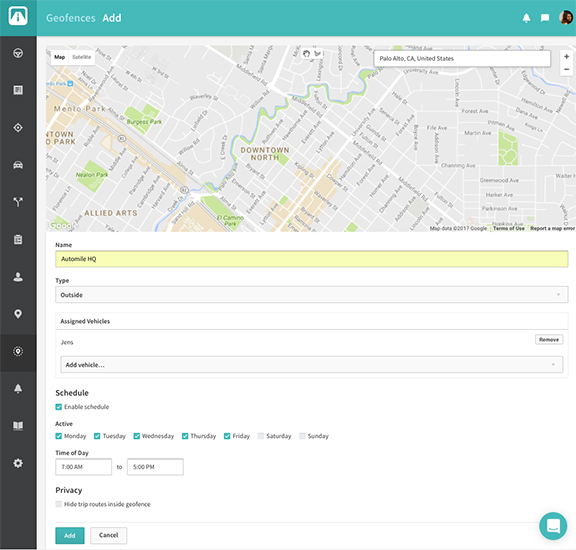 Now businesses can schedule geofences for specific days and time period. We look forward to sharing the next release soon! Promise you don’t have to wait for too long as our dev team is already at it.